More than half a century since it came on the scene, the XK120 remains one of the most beautiful automobile designs of all time. Yet, astonishingly, the car that wowed the press and the crowds on the Jaguar stand at the 1948 motor show had been put together in just a few weeks. The XK120 not only looked gorgeous but it also had performance and speed almost unimaginable in those days, with 120mph within its reach at a time when only an handful of exclusive models could reach 100mph and most family cars were beginning to run out of breath at 60. The twin overhead camshaft 3.4-litre engine had extraordinary qualities: it would happily allow the driver to dawdle along boulevards in top gear, while for the competitive owner it was fully ready to race - and to win - without further preparation. Anders Ditlev Clausager has drawn together material from the factory records and archive to provide historical and statistical information that has never previously been assembled. 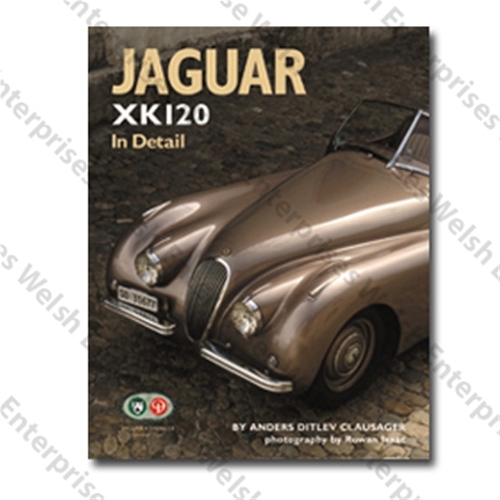 He sets out the background to the genesis of the XK120, and gives a detailed account of the development of the XK engine. He then tells how the XK120 was designed and goes on to describe its extraordinary debut in 1948. The evolution of the model is recounted, including the introduction of the fixed-head coupe? and drophead coupe? versions, and major production changes are listed, whilst production and sales worldwide are analysed in depth. There is a chapter on the wide range of competition activities in which XK120s featured, including Le Mans, with coverage also of record-breaking exploits. All the prototypes and works cars are individually treated, and the records have yielded extensive information on XK120s that became famous or went to famous owners. A section is devoted to special-bodied cars and "specials", and finally the author gives a view of the experience of owning an XK120 today. There are also appendices: the first lists the early alloy-bodied cars; in the second there is advice on identification and dating; and the third provides unprecedented detail on colour schemes. Five outstanding examples of the cars have been specially photographed for this book, among them NUB120 and Stirling Moss's Monthl?ry record-breaking fixed-head. In all there are some 100 colour illustrations, combined with more than 300 black-and-white pictures from the archives. In its exceptionally thorough examination of these most desirable cars, this book provides a rich store of knowledge for the many owners and enthusiasts who care passionately about them.